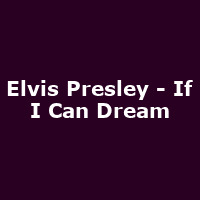 "If I Can Dream: Elvis Presley With The Royal Philharmonic Orchestra is a remarkable new album featuring classic Elvis vocal performances with brand-new orchestral accompaniment. An exciting revisit of Elvis' work, 'If I Can Dream' focuses on the iconic artist's unmistakable voice, emphasising the pure power of The King of Rock and Roll. Recorded at Abbey Road Studios in London, the 14-track album features Elvis' most dramatic original performances augmented with lush new arrangements by The Royal Philharmonic Orchestra."